To celebrate the release of Let There Be Light - In Cinemas 19th April - we have a bundle of DVDs up for grabs courtesy of Lighthouse Alliance, part of 4Digital Media. 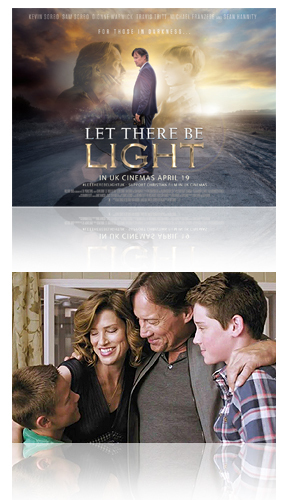 LET THERE BE LIGHT, sees Hercules star Sorbo in the lead role as an atheist who rethinks his life after an accident, alongside his wife Sam, who co-scripted the film with veteran writer Dan Gordon (the man behind Hollywood classics Wyatt Earp, The Hurricane). The cast also features some very familiar faces - veteran actor Daniel Roebuck (The Fugitive), Hannity (playing himself) and music legends Travis Tritt and Dionne Warwick, the latter performing one of the soundtracks superb gospel pop tracks. To celebrate the release of Let There Be Light - In Cinemas 19th April - we have a bundle of three DVDs up for grabs - I Can Only Imagine, God's Not Dead 3 and A Question of Faith. Kevin Sorbo is best known for which Popular TV Series? © 2019 4Digital Media. All rights reserved. Competition closes on April 30th 2019.